Does the world need a cure for living longer? By Ross Elliott - posted Friday, 5 May 2017 Sign Up for free e-mail updates! We are quick to celebrate advances in medical science which allow us as a species the opportunity to live longer. But the consequences of living longer are often glossed over. 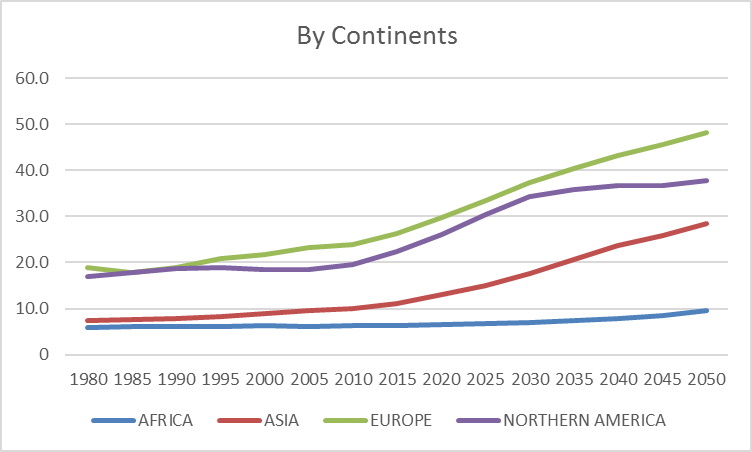 The economic consequence is that – worldwide – there are going to be more and more people in their old age relying on a smaller and smaller proportion of people of working (and taxpaying) age. It will affect different nations in different ways, so this is a quick wrap up based on the latest predictions from the United Nations population division. The old age dependency ratio is a formula that expresses the population of people aged 65 and over as a proportion of those aged from 15 to 64. A rising ratio simply means that there are more people aged 65 plus relative to those aged 15 to 64. There is almost nowhere in the world this is falling. 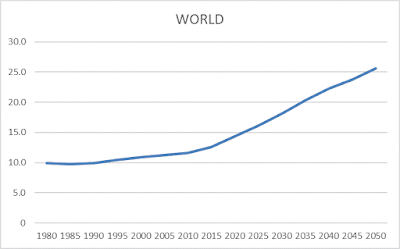 The world picture shows that we have gone from around 10% in the 1980s to one in four by 2050. Meaning that there was one person aged 65 plus for every 10 in 1980 but that this will change to one for every four in 2050. Those four will have to do the work that ten did in 1980, relative to supporting the 65 plus age group. 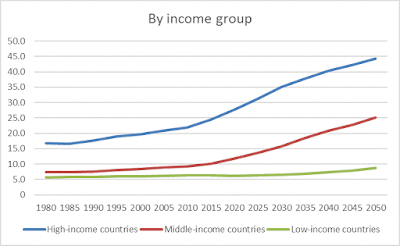 The rising dependency ratio is going to affect higher income nations with more developed economies to a much greater extent than lower income, less developed nations. The reason is pretty simple: wealthy nations can afford better health care and higher living standards. 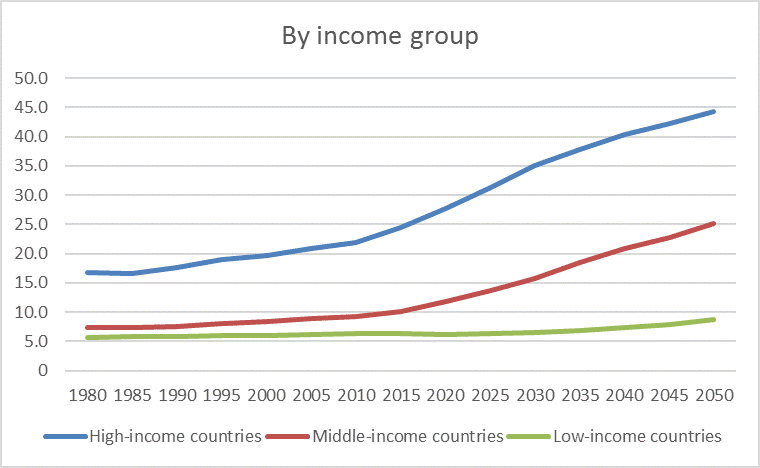 The difference is profound though – by 2050 high income nations will have a dependency ratio approaching 50%, compared with less than 10% for lower income nations. Will they be able to remain high income nations with this future burden? 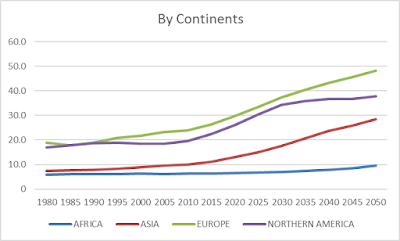 The continents that will be most affected broadly align with income status. 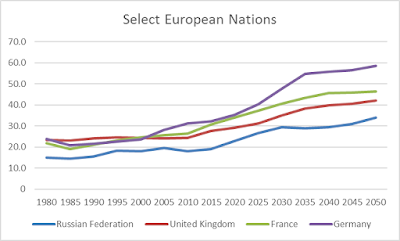 The worst affected will be Europe, with a dependency ratio nudging 50% by 2050. 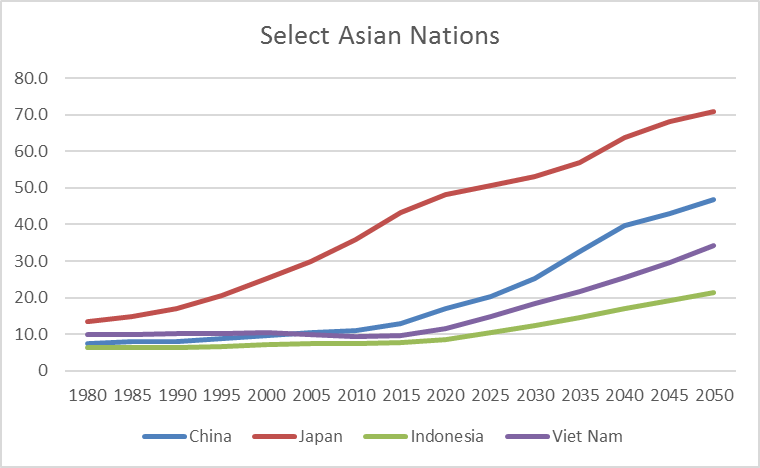 North America is not far behind and Asia will be rapidly closing the gap. Amongst the major European nations, Germany has a particularly nasty problem emerging on the forward radar – a dependency ratio of almost 60% by 2050. Little wonder German Chancellor Angela Merkel was so keen to attract such large numbers of refugee migrants (said to be more than 1 million in 2015 alone). 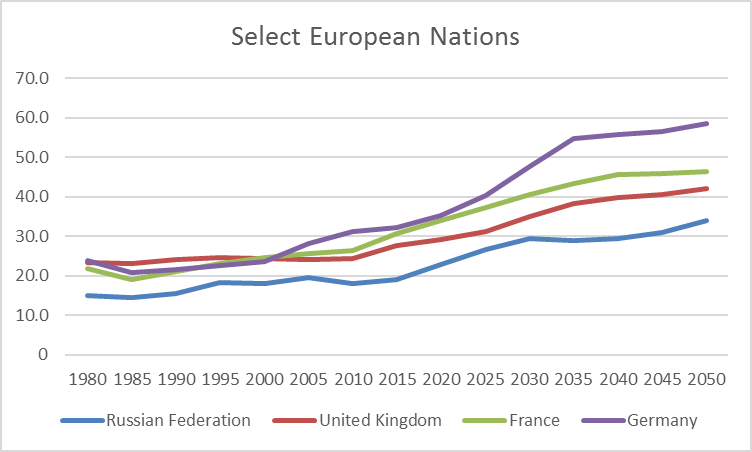 France and the UK are following a similar pattern although with slightly lower dependency ratios and Russia only passes 30% in around 2045. Closer to home, Japan is facing some serious problems. A forecast dependency ratio of 70% means there will be seven people aged 65+ for every ten aged 15 to 64. Japan’s dependency ratio is already problematic and this will get worse. 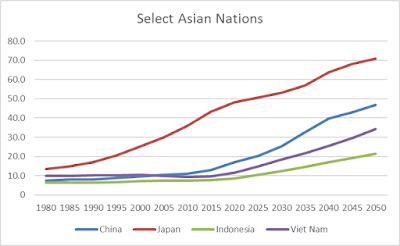 China is also facing a rapid escalation in its dependency ratio which will rise quickly from around 2025, effectively almost doubling in the ensuing 25 years. I wrote about China’s people shortage (being a shortage of working age people) a couple of years back. You can click here to read it. Australia itself shares a great deal in common with the USA and Canada in terms of our aged dependency ratio. 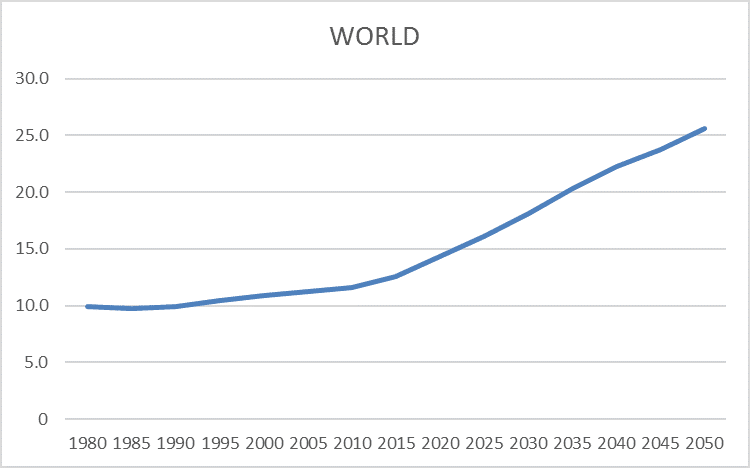 We are currently in the midst of a significant increase which will see our dependency ratio rise from a fairly stable band of 15% to 20% from 1980 to 2010, to one in three by 2035. This will pose a range of budgetary challenges on both the income (tax) and expenditure (health and welfare) sides going forward.